Well, here we are, back again in an Autumnal England. The colours are beautiful and it’s freezing cold! I left Athens one week and one day ago and I’ve had a raging cold ever since. Hopefully that will go in the next few days, as I think tissue demand is higher supply and if this continues, the end won’t be pretty. I also had a lot of time to myself in Athens. The Mister is a freelancer and so was sometimes able to visit for a few weeks, an other times he had to head back home (or to Germany where his work sometimes takes him). Before I went I took my first steps into trying out the patterns by Little Cotton Rabbits. Actually they’re the perfect thing to take away… I ended up making rather a lot. The one on the left should be going to a new home later this week. The one on the right was gifted to my mum on a quick visit back in the summer. This little lady had three different dresses, before finally settling back with the first one. After the addition of a cardigan it seemed the original suited her best after all, and she’s also gone to a new home. This one (mentioned in my previous post) was just a head for quite some time. She has a piebald patch, made with intarsia. Its not the neatest knitting, but she’s got such a kind face when you see her in real life it seemed a bit mean not to give her a body! As she’s not the neatest bunny she’s staying with me for a while, until I can find someone who loves her just as she is, imperfections and all. This little fella is exactly that. Little. I made him on 2.75 needles, rather than 3 and it made quite a difference somehow. He’s really compact and petite! I like him a lot, and he is waiting to be gifted to a gentleman at xmas. I think his jumper is the neatest I’ve ever made. I sort of made him as I wanted to make a brown elephant, rather than a grey one and actually I think the colour works quite nicely. This wee chap is also made on 2.75 needles as a bit of an experiment. I did actually buy this colour with the idea of making a blue bunny or elephant but thought that despite the yarn being technically the same size as the brown, it felt a lot thicker. In the end I decided to try it anyway and I like it. 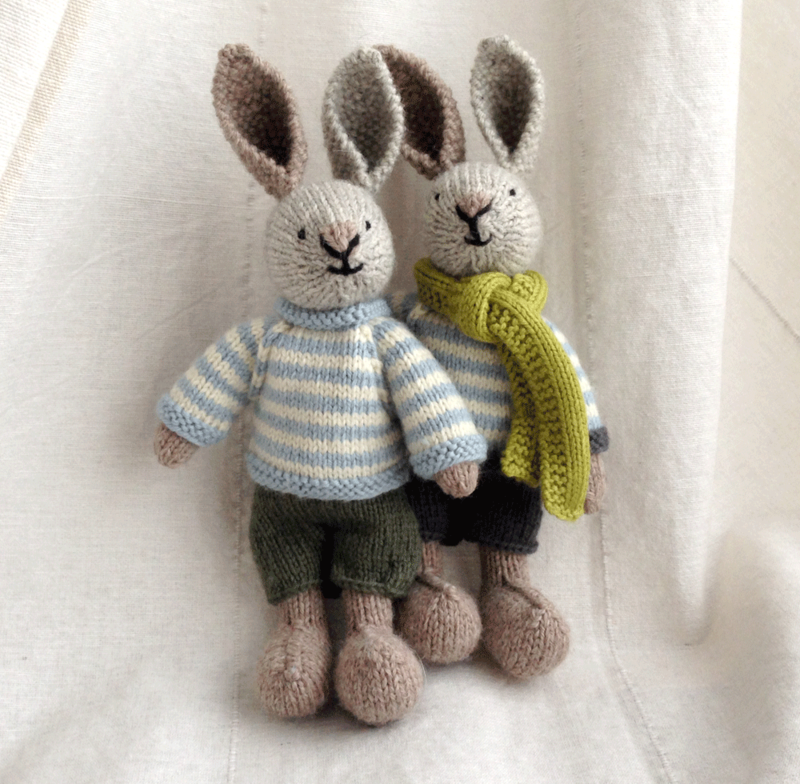 I know the jumper doesn’t suit him, I’ll make him a cream one I think, but I think blue is a good colour for a bunny! This elephant was made as knitting therapy before I went and kept me company throughout. I love her to bits actually. I am still in Athens and still knitting! Just not looking at my laptop that much at the weekends, hence the silence. I finally managed to make the new Greek elephant a lighter dress (on the left). It’s made in cotton, which I bought from a great yarn shop in Athens. I had a weekend to myself a while back, so packed up my elephants and took them on a walking adventure. The yarn shop was wonderful – but so was the owner, who took one look at the elephants and said ‘Little Cotton Rabbits!’ He’d actually spoken to Julie (the pattern creator) via Flickr quite a few years ago. I bought some cotton just to try out, and it’s very nice. I’m undecided as to whether or not this dress suits this elephant, but we shall see. I also made this small rabbit. He’s actually made on DPNs, which always ends up being way more stressful than a hobby should be, I think—but I do really like him. He’s very solid. I’m thinking he needs some clothes, but not entirely sure where to start with that. Maybe I’ll scale down some clothes from the Little Cotton Rabbits bunny pattern? Not sure. Never having gotten around to making human clothes, I’m not 100% sure how these things work! Just for scale, here’s the small rabbit next to just the feet of a Little Cotton Rabbits rabbit (Which is still a WIP as a type). It’s annoying actually, because it’s very cute really – but I’ve managed to make the body much neater than usual, so I don’t want it to have a messy head! I’m making these as gifts, so I’d like them to be as neat as possible. I’ve got two bodies with legs sitting next to me as a type. It’s a bit of a production line at the moment. Slightly worried that I’ll run out of stuffing soon, but I’ll have to cross that bridge when I come to it. I was feeling too lazy to attach beads but might do that next time. This is my own pattern, so I’m glad it worked out. Could do with a bit of adjusting but I think it’s quite pretty. I’m not sure why, but I got into the habit of tatting all the bottom rings first and then the upper rings on top after. If you do them alternately as you go it’s much neater. Looking back at old photos, I think I’d changed my technique for the worse, for some reason? ¯\_(ツ)_/¯ fixed now, hopefully! Will adjust it a bit and try it with beads next time. Hope wherever you are you’re enjoying what you’re making too. So got I out the knitting needles. Actually the wool I bought is good for the bodies but too heavy for the clothes. The pale blue dress is quite thick – it feels like it would make a nice jumper for me, but is a bit too much for a small elephant. I should get some cotton, as the pattern recommends. I’ve really enjoyed making these though. I must admit, I find stranded colour work a little stressful —so much counting and the threads get all intertwined, which drives me a bit nuts. I love the look of fair isle but how it doesn’t drive people insane I just don’t know. I’m not sure how much time I’ll have over the coming months to knit some more, but I was wondering if I should make a girl rabbit next? My own wee rabbit is all packed away in England, but maybe he’d like me to bring back a friend? We shall see. That said, I completely forgot to string any beads! There’s a lot going on at work at the moment, which I’ll probably talk about another time. Loads to think about and various different things that need to get done, both here and in other countries. So, I have made FULL use of the fact that knitting is a relaxing pastime! It’s nice to have something to focus on that keeps your brain still for a couple of rows at a time. Over this week I’ve been making the cardigan (from this pattern). This is actually the second version—the first one was a kind of yellow (although I’m not 100% sure if it’s a good yellow) and a bit fluffy, despite being the same brand / size / make as the blue wool in this pic. I knitted the body on 3mm needles and it was a bit big. It looked like a padded life jacket to be honest, so I frogged it and started again. This was on 2.5mm straights and these *lethal* looking 2.75 dpns. I kind of love these needles for the fact they’re just pointy metal sticks (no frills, no details), but honestly, they could have your eye out. Its a very cute little cardigan. A little fiddly – I’ve not really knitted anything quite like this before, as the jumpers are constructed in a different way. I do understand why people like knitting top down jumpers now though, being able to try them on is great, even if it’s not you that’s doing the trying! I’m still not a huge fan of repeated knit stitch, as it never looks as even as I’d like. How do you get a neat edge? This is ok but I’d prefer it if I could get that central edge neater… Anyone have any tips about that? Again I used the teeny tiny buttons, and they are the perfect size. The two dark ones match the buttons on her shoes, and there’s one bright red one in the middle. She does look very cute with it on. A bit like she’s all ready for her first day at school. The only downside is that I’m still in love with her dress! Yesterday was a bit of a weird one here, a bit disjointed. Weirdly I ended up with a lot of time to sit and knit while the world moved awkwardly around me, and so I set to work making Nell’s dress. (I’ve decided she’s called Nell. She doesn’t seem to mind). While there is a dress that comes with the elephant pattern, I really like the dresses I’ve seen on Ravelry with capped sleeves, so I splashed out and bought the seasonal dress pattern, which has lots of different charts. Deciding which chart to go for is tricky, and in which colours—and then if you’re going to modify the way you use the colours… there’s a lot of choice. In the end I went for the blue to match the shoes (probably wouldn’t match shoes and main colour of dress again actually – which she’s sitting down there’s a lot of blue) and added the brighter green to make it a bit more cheerful. I knew I wanted the green at the top. I also added little buttons to her shoes. I wasn’t 100% sure I’d be able to do that, but knitting is so much more flexible than crochet it wasn’t too hard to bend her feet around and squeeze the needle through. I love these teeny tiny buttons. The people that make them must be amazed that anyone can find a use for a button so small. You can see that I need practise on the colour work – the tension is a bit ropey. Also you *really* need to concentrate! I used the point of a pair of scissors to point at every stitch on the chart as I worked, otherwise you look up for a sec, look down and have no idea where you are. The pattern actually recommends cotton for the elephant and the clothes. You can see that I’ve used wool for both, as that’s what I had available. I like Nell (the elephant) in wool, but you can already see that the dress is way too fluffy (and will probably pile). It kind of loses the detail. Seeing as I’m already planning more—they’re really addictive—I’ll probably use up the wool I have but think about buying cotton to try at some point. After making the rabbits, I honestly didn’t think I could be more thrilled with a toy, but I’m so pleased with her! The pattern is amazing. I really didn’t think you could get knitting to be as nicely 3d as you can with crochet. And no DNPs! The construction and shaping is really clever. I have no idea how long it must’ve taken Julie to figure out these patterns and then write them down, but she deserves every penny and all the praise she gets! I won’t say they’re easy, but they’re definitely manageable, and watching them come together is a lot of fun. Question now is… do I make her a little cardigan as well? Maybe I should actually do something useful first, like clean the house… Hmm. After the total joy of making two rabbits (one hopefully now settled into his new home) I decided to take a risk on an elephant. I say ‘take a risk’ as she looks pretty complicated to me—I didn’t want to just assume this would be a breeze, and then get super frustrated. I still consider myself a new knitter to be honest, and there’s lots of techniques I don’t know or need to look up each time. With the bunnies I started on the feet as they seemed like the most complicated part. With this one I started on the head, because if you can’t get that right you’re kind of stuck. My first effort was shaping up nicely… until I realised I was rushing a lot and had missed a complete 10 rows! I’d already got onto the ears and couldn’t work out why there were so enormous. They weren’t, her head was too small. I started again. The second time, I found shaping the trunk a little hard – you need to pull on the wool that you’re sewing the seam with, to make the trunk curl. It snapped. If you’re doing this yourself, I’d definitely recommend strong yarn for that bit of seaming (as it says in the pattern), or curling it about 10 stitches a time as you sew, instead of in one go when you get to the end. Once I’d made the head, I stitched the eyes… And I just didn’t like them. Eyes are SO important, and can really make or break a toy (as I know I’ve said before.) They just weren’t in the right position. After living with them for a day and looking at everyone else’s in Ravelry I decided to unpick them. Then she had no eyes for a couple of weeks. At this point I was kind of disappointed as I just didn’t think I’d get them right, but I made the rest of the body anyway. I was going to give her solid coloured tights and then changed my mind, which is why she has that darker blue band around her tummy. Also, I changed colour too soon – there’s a rogue dark blue row that shouldn’t be there. I found the shoes relatively easy to knit, but tricky to sew together neatly. One is good, the other not so good. They definitely get better with practise I think. Same goes with stitching the legs to the body. I’ve looked at a *lot* of others on Ravelry and there’s definitely a technique to attaching the legs to the body that I don’t have yet. But that’s not so bad… a good reason to make another one! With the eyes I suddenly had a brainwave – its not that much of a revelation to most, but it worked a treat for me. I got some pins with the round plastic balls for a head. I spent ages positioning and repositioning them. Finally when I thought they were in the right place I stitched the knots in — and it worked! She went from being a bit of a problem to something I was super excited about making. It’s amazing what a difference it makes! 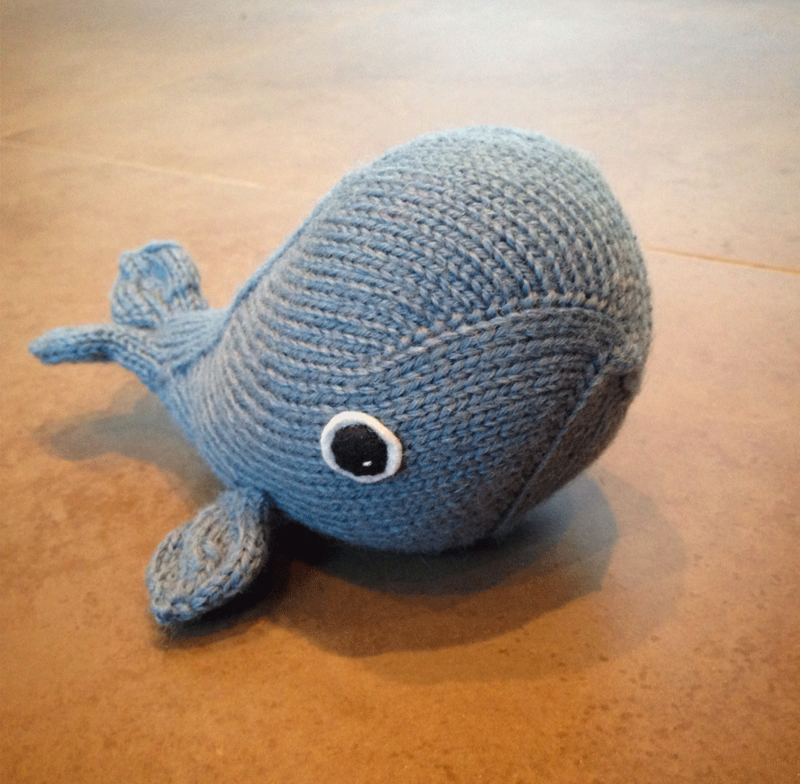 It transforms a project from ‘some knitting’ into a little character of her own. Last night I stitched her all together. (Probably not a good idea after a long day but I had a free evening.) I’m so pleased with her! Looking at the attachment of the legs to the body this morning I’m a bit less thrilled, but she’s such a lovely little character. I still can’t get over the fact I’ve managed to get enough skills to make something so nice. It’s like being given a gift. I’ve really enjoyed making her (despite the ups and downs) and there’s still a dress to come. And on that note, time to start the 90 minute commute and think about what colours her dress should be. Hope all’s well with you. Happy New Year! Hope you had a good break over the holidays and your new year is going ok so far. I’ve not been the best blogger, I have to admit, but wow, December was busy. In between work and travelling for work I did manage to race through some knitting. 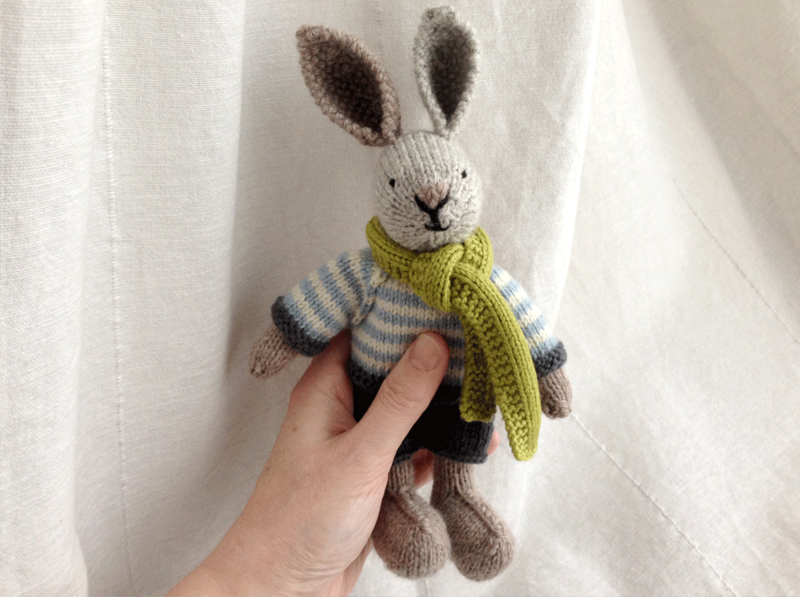 He is, I have decided, the gift for the baby I was knitting the original rabbit for. After thinking about it, I decided that you need something a baby can have a bit of a chew on, chuck about a bit, squeeze and pull in any direction. Something a more solid shape and construction seemed like a better idea, and so I went for this pattern. (Ravelry link). Overall I enjoyed making him… until I got to the tail. It’s knitted on DPNs and just didn’t end up as neat as I would’ve liked. I also decided to sew on fabric eyes, rather than the usual plastic eyes (better for a baby). This was a bit of a pain as it turns out the black ‘craft felt’ from John Lewis is thin, disintegrates quite easily and is just… not very good quality. A lesson learned. 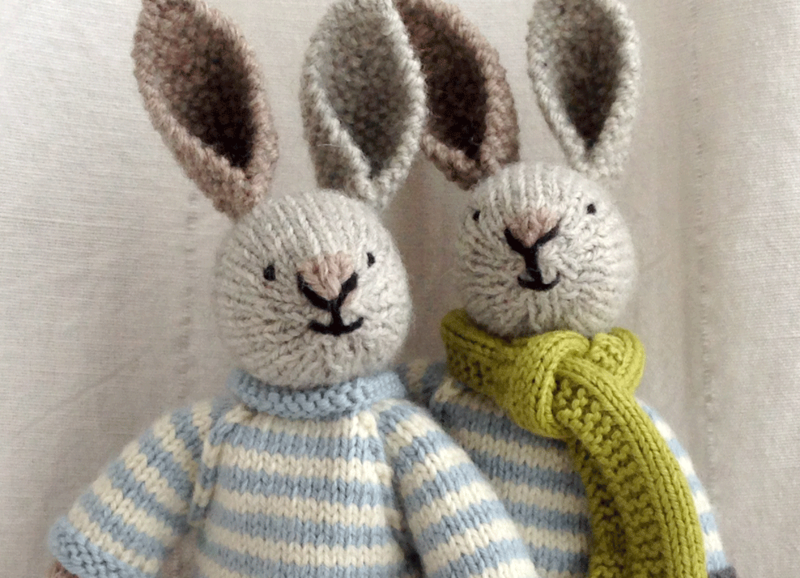 And back to the rabbits… What a delight to knit! I’m genuinely thrilled with how they’ve turned out. Of course there are things that could be better and neither was completely struggle-free but still they make me smile every time I look at them. The pattern is from Little Cotton Rabbits. It’s the boy bunny with the piebald patch, although on these occasions I added the nose but not the patch. (I did make one head with the patch but wasn’t 100% happy with it. I’ll try it again another time though, because it is very cute). I just happened to have blue and white wool available for the jumpers and so I used that to match the pattern exactly. They’re such a lovely size. They’re also exceptionally cute without being ‘twee’; no cartoony cutesy short cuts – no big eyes or overly large heads. Something about them being small but perfectly proportioned makes them even nicer. I made the one with the scarf at the request of an ex-colleague. He said that the only thing his wife had said she actually wanted for her 50th birthday was “one of your knitted rabbits”. Which was of course very flattering but having only ever made one before I did say he’d have to turn a blind eye to the odd wrong stitch! Here’s a slightly odd picture of their bums! They each have a little tail that pops out of their shorts. You can also spot the tiny button I used to close their jumpers. I love that you can take these on and off. Seriously – the jumpers themselves are so cute they almost give you a heart attack. If you’re thinking of making one for yourself and wondering if you can do it, the answer is yes, you probably can. The patterns are well written and illustrated with photos. Anything that isn’t a knit or a purl is also explained and very easy to google for a video tutorial should you need it. They’re knitted flat and stitched together, which for me made it even better. While I hate sewing, I hate small knitting on DPNs even more. Knitting them flat was almost – dare I say it – relaxing. They take a while to stuff and to sew together, but personally, I found it easier / more enjoyable than sewing a crochet amigurumi. I crochet really tightly and getting a needle through crocheted fabric was always a horror. I did actually make the second rabbit and decide I wasn’t happy with the eyes. After a lot of ‘Really? At this hour? GO TO BED’ internal dialogue I decided to snip them out and redo them. I’m glad I did, he’s much nicer now. It’s always worth taking extra time on faces I think, no matter what type of toy you’re making. If there was one problem with this pattern I would say that it’s *really* addictive. They’re now all I can think about. I’ve already bought the pattern for the elephant though, and so will try that next. I must admit, I’m not expecting to do so well on that one, so will definitely start with the head first and see how it goes. (For some reason I started with the feet for the rabbits). Anyway. Happy new year! Here’s hoping we always have a chance to sneak in a little bit of time for ourselves this year. You are currently browsing the Occasional Crafter weblog archives.